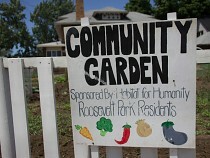 The Roosevelt Park Community Garden will be revitalized on June 10th. 25 volunteers from Lowe's and the Roosevelt Park community will join forces with Habitat for Humanity of Kent County on June 10 to revitalize a Roosevelt Park neighborhood. Lowe’s awarded Habitat Kent a $35,500 grant to help complete the project. Habitat Kent will hold a series of beautification and arts celebration events in the neighborhood throughout the summer. Lowe’s volunteers will kick off the beginning of the neighborhood Curb Appeal Competition by making major improvements to the neighborhood community garden. These beautification events will be part of a larger preparation for SiTE:LAB's Rumsey Street Project, their 2015 Art Prize submission slated for the fall. Roosevelt Park will be the first extended city area of Art Prize outside of Fredrick Meijer Gardens.